True to form, two days after conducting a hostile and combative interview with former Israeli Ambassador to the U.S. Michael Oren, CBC As It Happens and Anchor Carol Off doubled down yesterday evening by giving a platform to Avner Gvaryahu, the Executive Director of the anti-Israel radical organization known as “Breaking the Silence” to condemn Israel. To listen to the program click here and advance to the 48 minute mark. In what was likely an attempt to walk-back the controversy that AIH and Anchor Off had created which saw Michael Oren accuse Carol Off of being a “conspirator with Hamas” and an “abettor of terrorism,” the May 17 broadcast of AIH began with Co-Anchor Jeff Douglas quoting an official spokesman for the Israel Defense Forces who stated that his soldiers are professional and were restrained. AIH then segued to an interview with a former IDF soldier, now Executive Director of Breaking the Silence, Avner Gvaryahu. Carol Off seemingly played devil’s advocate by quoting Michael Oren and prodding Gvaryahu to condemn Israel. Gvaryahu was happy to follow Off’s lead and declare that Israel’s actions were “shameful” and that there must have been a better way to disperse the “demonstrations”. Of course, he did not provide any alternatives for how Israel could do that. Gvaryau claimed the IDF wasn’t justified unless there was a “direct” threat to soldiers or to Israeli citizens. This was of course an absurd suggestion because the threat to Israeli citizens wasn’t going to be “direct”: It was the threat of tens of thousands of Palestinians breaching the fence and infiltrating communities and kidnapping or murdering Israeli citizens. Gvaryahu acted as Hamas’ advocate by ceremoniously dismissing Hamas’ own claims that 50 of its members were killed in the fighting. 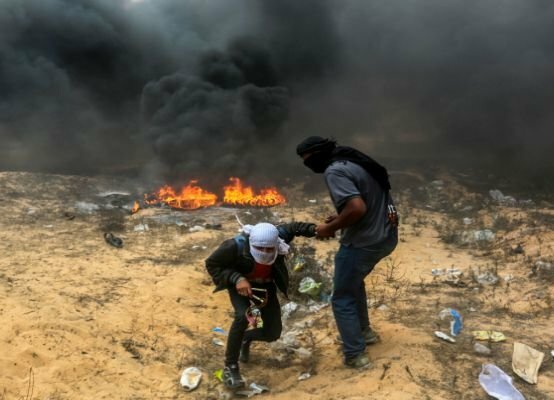 Yes, AIH mentioned that Hamas is a terror organization and that its operatives were in the ranks of protesters to harm people and that they had grenades and firearms, but the thrust of the interview was to hammer how “Israeli soldiers shot so many Palestinians on Monday” which based on Carol Off and CBC As It Happen’s portrayal, the programmers opinions are patently clearly that the IDF wasn’t “justified” in its actions. Importantly, at no time did CBC As It Happens and Anchor Carol Off inform its listens about the biased background and faulty metholodgy of Breaking the Silence. For more information about BTS’s bias, see NGO Monitor. This is another disturbing example of CBC bias against Israel, emanating from its flagship radio program, As It Happens and Anchor Carol Off.